The Fryette Power Station Integrated Reactance Amplifier is an easy to use Power Attenuator for controlling the volume of high-powered amplifiers with none of the drawbacks of a conventional attenuator, and a Tube Power Booster that can turn any mini-amp, preamp, pedal, modeling amp or modeling app into a gig-ready amplifier! If you have ever used a traditional Power Attenuator, you have already experienced the loss of tone and dynamics of your amplifier at various volume settings, and the frustration with the rotary level switch that always seems one step too loud or one step too quiet. Perfectly preserves the tone of the attenuated amplifier at any volume setting down to whisper level. Preserves the dynamic feel and speaker response at any volume. Provides a post distortion integrated effects loop. Provides an XLR balanced and a 1/4-in. unbalanced line out for direct recording or live performance signal processing. Choose 2/4, 8 or 16 ohms separately for both the amplifier and cabinet matching. No more nerve-wracking impedance mis-matching that could damage your amplifier. Compact and easy to carry, the Power Station sits comfortably on top of an amp head, combo or desktop. Completely safe for any tube amplifier. Any small amp, preamp or modeler can cut a live gig with a full band. Crank a mini amp to the threshold of destruction, then adjust the Power Station to preserve the original tone or create an entirely new identity for it. Perfect as mono power amplifier for guitar preamps, floor preamps and modeling preamps. Ideal as an effects power amp for a Wet/Dry amp rig or a monitor power amp for live modeling direct to FOH. 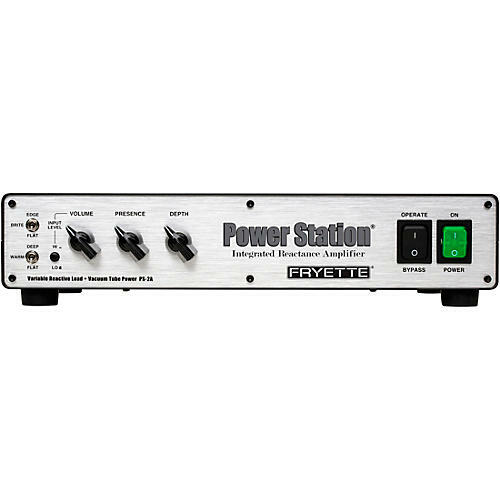 Great as a desktop power amp for adding tube power to direct recordings for any instrument or signal source. Silent Mode feature provides versatile reactive load for silent recording using low or high powered amplifiers. Silent Mode, Balanced XLR Out and Unbalanced Line Out remain operational even with power disconnected. The Power Station provides a variety of performing and recording solutions for every kind of playing or performing application/environment. The Power Station breathes new life and functionality into any amp large or small. Dimensions: 14 x 2.75 x 9 in.